Give your car the best cleaning it's ever had. 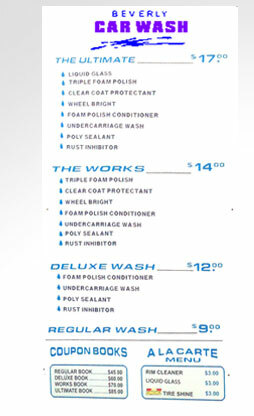 Check our wide range of car wash service to meet your car care needs. Rest easy, knowing that your car is well cared for when using our facility. Keep your car looking new, inside and out with our state of the art products. Our self-serve area is open 24 hours a day, 7 days a week. 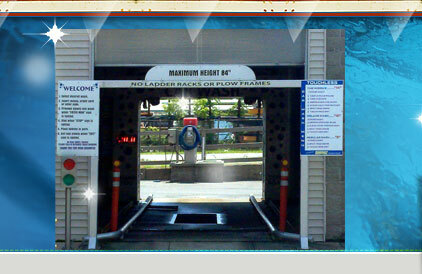 We feature 4-self serve wash bays and six coin operated vacuums. Our whole premises are well lighted and monitored by security cameras. Our state of the art touchless automatic uses the highest quality products. For our customer's convenience, the automatic cashier takes bills, coins, credit cards and codes. Change machines are also available on the premises, plus a car care vending machine. Delivering clean, dry and shiny vehicles in our all soft cloth tunnel is our goal at Beverly Car Wash. We've developed a unique wash process style developed by our distributor that safely and effectively cleans the exterior of your car in minutes. Our simplified price menu of services, offer a package that is suitable to your needs.